Why is it that so much rides on dinner? Instead of a chance to stretch the imagination, we play it safe. That is because we aim to please. We spin around the kitchen preparing a meal that ends with smiles. Until it doesn’t. Routine has a way of foiling our intent to delight. Precisely because it is routine. The mind enjoys surprise. A change in pattern brings novelty and excitement. So when freedom comes in the form of cooking for yourself, sieze the day. Ignore what your mamma told you and play with your food. 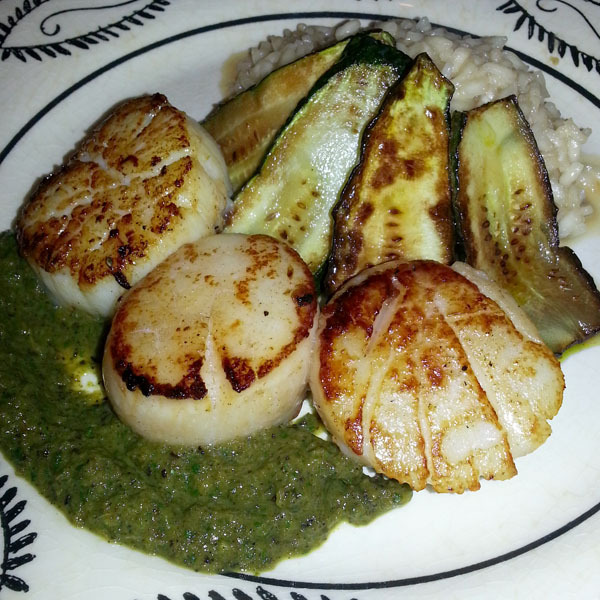 Sea scallops are home in the cold Atlantic waters. To New Englanders it is one of the seafood staples. And like a good Puritan, the treatment is simple. The fancy chefs make lemon butter sauces to coat perfectly seared scallops. The people of the coast simply fry the upscale cousin to the barnacle. It lands non-descript on a plate sided with lemon wedges and tartar sauce. The meat is sweet and delicate. The hands that served it are salty and weathered. Recently when the family was away, my test kitchen opened up. Peppers are the fruits if the New World. The cone shaped, dark green ones are called poblanos. Slightly spicier that a green bell pepper, these vegetables are the foundation for so much of the central Mexican cuisine. Thousands of miles from the ice-chilled ocean, cooks have been brewing sauces from fresh and dried varieties. If you love chili, thank the mighty poblano. Dried, they are called ancho chilies and the anchor for the national dish of Texas. Enter the shotgun wedding. The Mexican Temptress and the Salty Sailor. Sautéed then pureed, the poblanos joined onions, cilantro, lemon and salt. A touch of honey for balance. This goodness forms a pesto. It smacks of the sour, fresh notes we know from tartar sauce. The color of green darkens the plate and alarms the eye. This is not normal. On the tongue we discover the familiar and the fancy. One or two steps removed from the ordinary. Just enough to catch attention. Precisely what the “restaurant of one” can offer its most favored diner, you. A chance to be daring. A chance to pull from two heritages to make a new inheritance. Ask Mark Miller from Coyote Cafe in Santa Fe. His striking cocktail known as the Chimayo is nothing more than an updated spiked cider. Its the result of a New England boy with an adult palette of Southwest flavors. We delight in his inventiveness. His modernized memory. Now that we have that out of the way, what will you do the next time the house empties? You have creative license. What are you willing to risk to find glory? Inhale and leap. Try it. Fail. Try it again. Succeed. No matter, with a single plate, the risk is low. And when you find the gold at the end of the rainbow, then share it broadly. Just be sure to keep us updated. We are there in spirit. Shotgun and all.